• Voyage: Esbjerg Denmark, to Harwich UK. 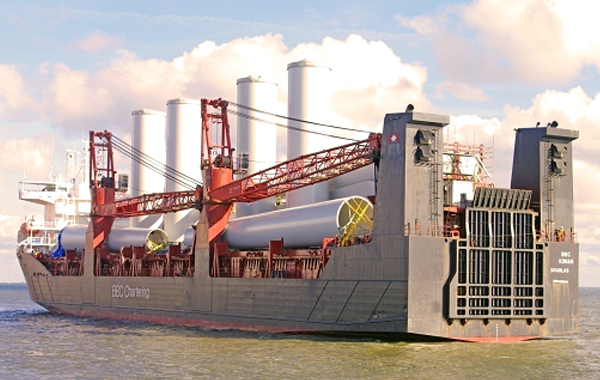 • Cargo: Siemens 110t, 23m Lower tower section. • Sail cond: 2.5m significant wave height. The project originally began on a 12000dwt vessel with a stern superstructure. The cradle design was developed to meet the structure of the vessel based on her strength and motion analysis. As in all large projects the client & charter party imposed project deadlines & conditions. These included a vessel motion boundary condition that all motions and structures were to meet a 2.5m significant wave height. This boundary would enable the vessel to sail more frequently, thus have an increased turn round time. This boundary condition was met by the design. An unforeseen issue occurred late in the project due to the flag of the vessel and its classification. A substitute vessel was proposed with a forward superstructure which removed the visibility issues and would meet port authority regulations. This late substitution to the vessel in the project occurred during the manufacturing stage of the cradles. MBM was on-hand to undertake this change to the project and find a solution for the client. A re-evaluation of all motions and structures were undertaken for this vessel, and MBM provided a cost effective solution to overcome this introduced issue. The main issues were structural strength, and project management issues from this scenario. The new proposed vessel (BBC Konan) underwent a thorough motion analysis, and structural survey, to confirm the solution. The final solution (shown below) was achieved with only minor alterations/additions to the existing cradle. This was a significant achievement given the short period to undertake all the analysis required and to provide a solution that would maintain the project schedule for the end client. The cradle design was undertaken with the use of FE analysis, structural hand calculations, and vessel motion analysis based on DNV ruled and regulations. The engineering drawings that MBM produced were used in the manufacture process. An initial inspection survey was undertaken to assess the tolerances of the design, and confirm the progress of the manufacture remained within the project schedule. Once the manufacturing was complete, the process to position the cradles onboard was undertaken. MBM Consultancy was on-hand to make sure the positioning of the cradle on the hatch covers was accurate, and that all securing methods were adhered to, i.e. 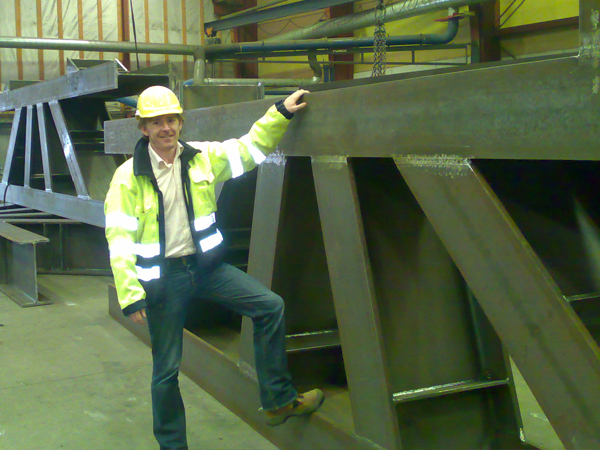 steel to steel contact was created between cradle and deck to create a strong weld. During the loading sequence only minor adjustments and position issues were required to gain sea fastening. These were put down to a minor manufacture issue, an unknown structure in the tower, it being a new operation, and it being a new loading technique. These were all overcome and the team provided this exciting industry with a ground breaking project that was loaded successfully. 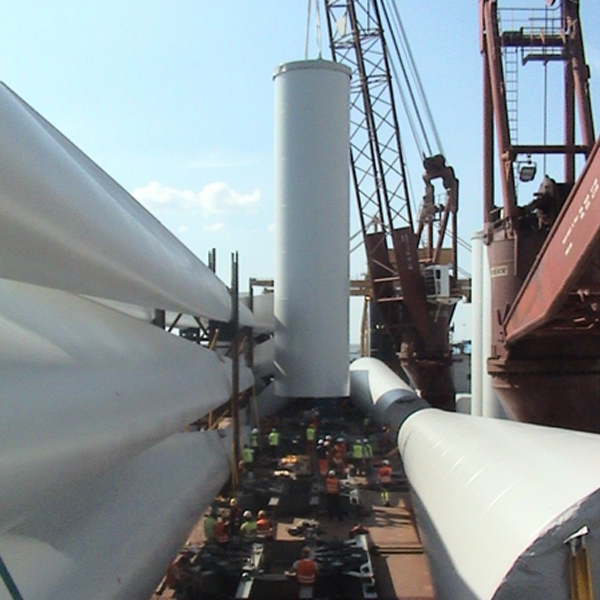 During the loading of the cargo MBM was onsite to co-ordinate the placement of the grillage, and maintain the correct procedure for securing the grillage/cradle to the hatch cover was adhered to and undertaken as specified in the detailed design and analysis. The vessel sailing condition has the boundary condition of a 2.5m significant wave height. This boundary condition did not prevent the vessel sailing, and is an improvement to the boundary conditions imposed on barge transportations. Thus the vessel can sail more frequently than other vessels.